Have you seen the new brads over at Eyelet Outlet? You must check them out! I love these little train brads. They come in lots of bright primary colors, but I wanted to use all red for my valentine. I coupled them together with some black bling and then added the same bling to the scallops toward the top of my tag. To finish off the tag I added some glittery heart brads - also from Eyelet Outlet. With each release, they come out with the most ingenious brads!! 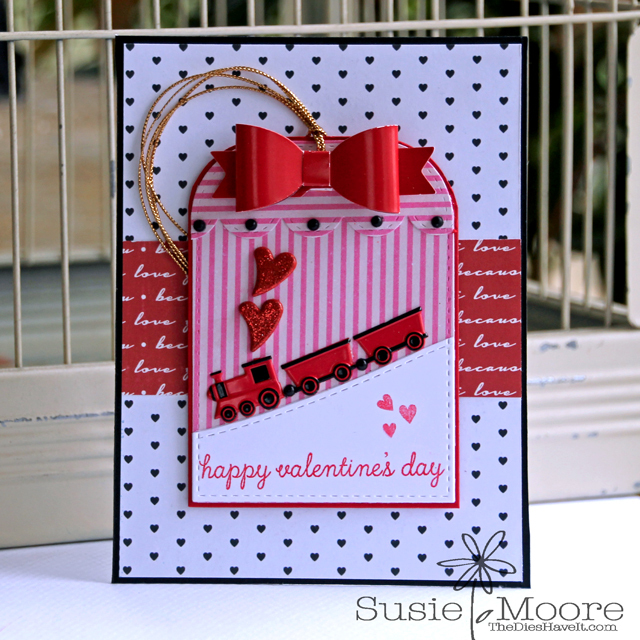 I am off to make some more valentine projects for you. I'll see you tomorrow with TWO posts. OMGosh this is so super cute. Love this train.